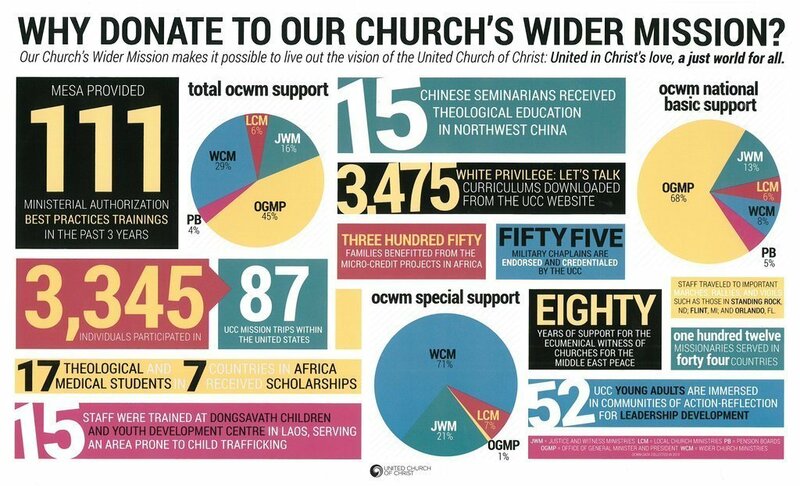 Our Church’s Wider Mission (OCWM) funds the work we do in the Conferences as well as in the national and global church. 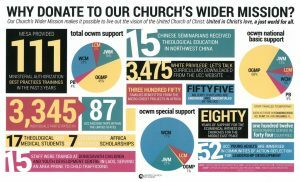 OCWM funds are invested in programs, resources, and tools needed to keep local UCC churches strong, effective, and growing. OCWM helps provide pastoral placement and education for church leaders; worship materials and theological interpretation; resources and training for stewardship and fundraising; and so much more. We are one church—a united and uniting church. We are the United Church of Christ. The ministry projects we support reflect the UCC’s core values of continuing testament, extravagant welcome, and changing lives. Our call is to tell the good news of the Stillspeaking God so that all who seek the healing love of Jesus Christ can hear. All OCWM Basic Support payments and all Special Offerings should be sent to the Southeast Conference Office, PO Box 1950, Decatur, Georgia 30031-1950. If sending online, please make sure you are on the SECUCC.ORG website; NOT the national UCC website.